The United States was behind “a state coup” in Ukraine having spent $5 billion on these purposes, Russian Security Council secretary Nikolai Patrushev said in an interview with the Kommersant newspaper published on Monday, according to Russian news agency TASS. "The change of power [in Ukraine] prompted those events that took place there. [U.S. Secretary of State John] Kerry has an assistant - [Victoria] Nuland, who said the United States spent $5 billion to arrange those events," he said. In fact, as Nuland’s comments at the time made clear, the figure of $5 billion referred to the amount of aid the United States had given Ukraine from 1992-2013 in a range of areas of state-building efforts. Russia has received around $20 billion from the United States for the same purposes from 1992-2013. Patrushev said it was absolutely clear that behind the "destabilization project in Ukraine was an attempt to create an instrument to weaken Russia dramatically." "Concurrently, they are seeking to solve the task of keeping the European Union countries on a short leash by imposing anti-Russian sanctions and approaches on them, ignoring their national interests," Patrushev said. According to Patrushev, the United States, which “loathed” Ukraine’s former President Viktor Yanukovych, "decided to topple him by force." "It was a political mistake. If they had waited a little bit, they would have been able to install people they like by legal means. But they engineered this coup instead. There would have been no developments in Crimea and eastern Ukraine if there were no coup." 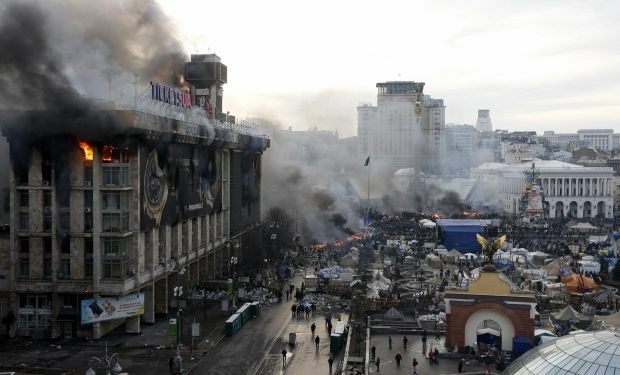 In fact, former Ukrainian President Viktor Yanukovych fled Ukraine after the failure of a bloody crackdown by his security forces on mass protests in the Ukrainian capital against his increasingly authoritarian rule. Yanukovych came under months of mass public pressure to stand down after backing out of signing an association agreement between Ukraine and the EU. Patrushev said that Yanukovych had not postponed the signing of the association agreement with the European Union because he had been pressed to so by Moscow. "He simply came to realize that he overlooked what its implementation was fraught with. Ukraine is member of the free trade zone of the Commonwealth of Independent States (CIS) and the consequences of this step were explained [by Moscow] to Yanukovych. He had not considered them before, so he decided to take a timeout to scrutinize the details," he said. To blame Russia for the Ukrainian crisis, Patrushev said, was to confuse the cause and the consequence. "It’s like saying that the wind is blowing because the tree branches are swinging," he said. As UNIAN reported earlier, Chairman of the State Duma's Foreign Affairs Committee Aleksey Pushkov said that the West had engineered a state coup in Ukraine in February 2014 to drag the country into NATO.